All of the words that follow are - in a way - a complete waste of your time. What we have here are two cars that are from different segments, probably bought by two very different buyers. 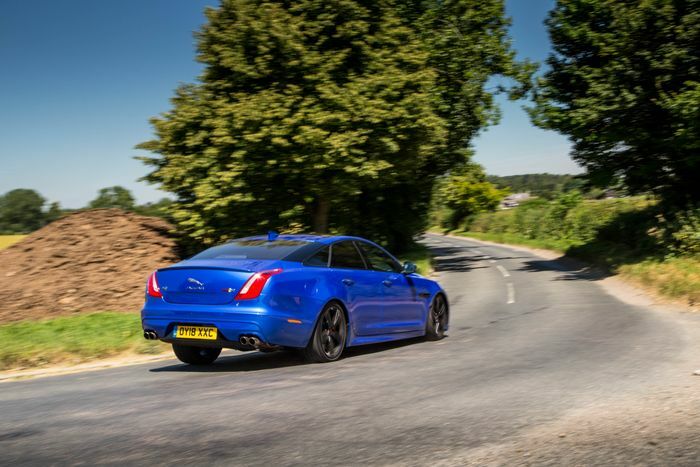 Oh, and having only been launched to the press last November, the XJR 575 isn’t even sold in Europe any more. You can thank WLTP for that. But hold fire, keyboard warriors, as there is some sort of vague method in our madness. 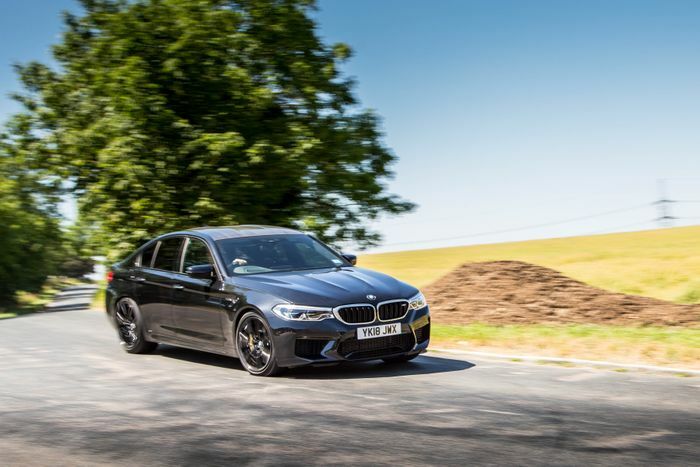 Facing the new BMW M5 against a Mercedes-AMG E63 is just a bit obvious, isn’t it? 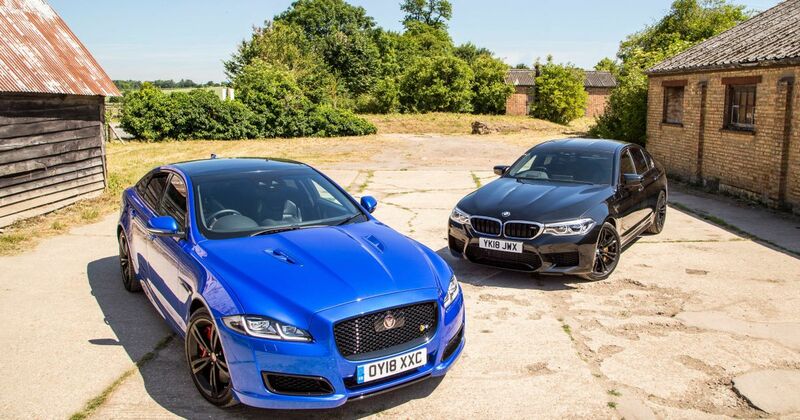 What we’d love to do is field it in battle with something British and a little left-field like, say, a Jaguar XF SVR. But there’s no such thing. What does exist is the XJR 575, which isn’t much bigger, has a comparable weight figure, isn’t actually much more expensive (£93,710 when it was sold here vs £89,640 for the M5) and… well, that’s where the similarities end. 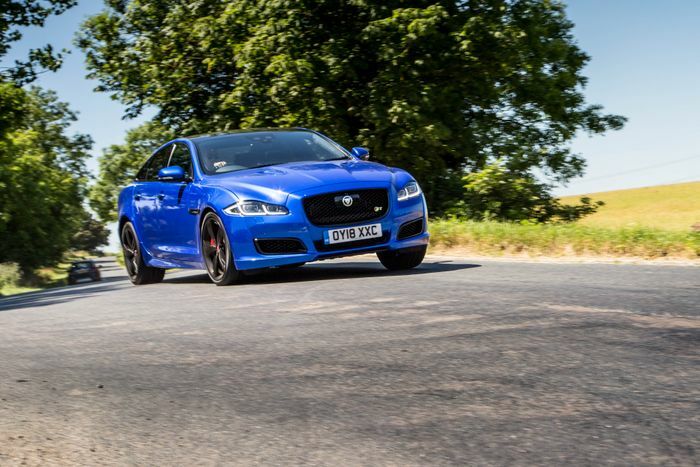 Where the M5 is a 592bhp tech-fest, the Jag is a supercharged anachronism on 20-inch wheels. But let’s start with the more cutting edge side of this unbalanced equation. Bloody hell the M5 is quick. I should know that already, having driven the car in Portugal last year and almost suffered a code brown while attempting to follow a DTM champion at Estoril circuit, but at home on my local roads it feels absurdly fast. Few big turbocharged engines have as little lag as the M5’s 4.4-litre V8. It’s after 3000rpm that it really comes on song, catapulting you forward forcefully enough to make it feel like your insides have been compacted to half the size. 0-62mph takes 3.4 seconds, 0-124mph is done and dusted in 11.1sec, and if you go for the optional higher top speed limiter, it’ll keep going until 189mph. It really wasn’t long ago that you’d need to look to the pointier end of the supercar market to go this fast. There’s something exotic about the engine, too. It’s not the rudest or loudest V8 out there, but thanks to the way the exhaust manifold evens out the exhaust pulses, this cross-plane V8 sounds more like it has a flat-plane crank. Like a moodier McLaren 570S, if you will. Crucially, that weapons-grade powerplant is brought together with a trick all-wheel drive system and one hell of a chassis. The grip and traction seems to be endless, and once you switch to 4WD Sport - which also slackens off the stability and traction control - you get a pleasing amount of movement from the rear wheels. It’s not a monster when you switch to two-wheel drive either, although some of that will be down to your subconscious making your right foot a little more cautious. For such a heavy car, the front-end is incredibly pointy, and for the first time ever, this is a BMW M car with Sport Plus steering I can get on with. Switching to the most extreme steering mode in an M Division machine normally means loads of stodgy artificial weight, but that’s not the case here. It’s a quick rack, too. As for the damping, Sport Plus is a little too stiff for the road, with the beautifully compliant Sport mode being your best bet away from the track. 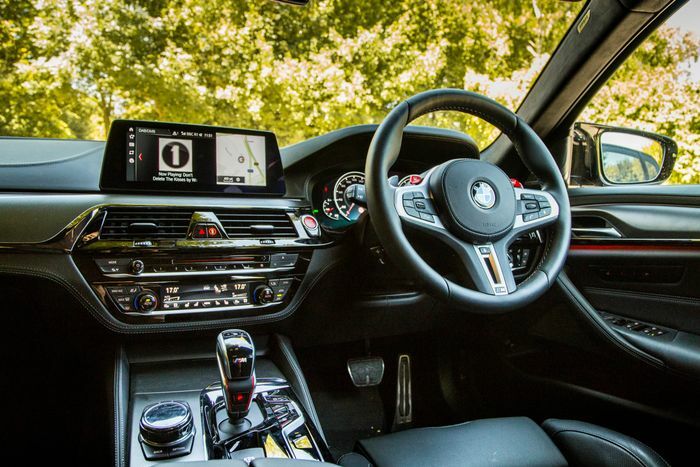 When you stick everything back into Comfort, the M5 becomes relatively wafty, but still quite firm. There’s no disguising what kind of car this is. But in the Jaguar? Whatever mode you set it to, it’s like floating on a cloud. 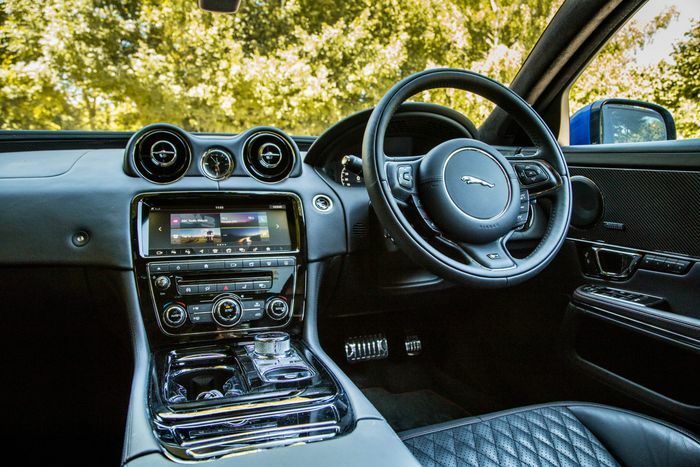 It’s less a car, more a two-tonne magic carpet that will scoop you up and whisk you to your destination in the kind of comfort that makes a first-class transatlantic flight feel like slumming it on Ryanair in the middle of stag party season. There is a problem, however: this ‘cloud’ is powered by a 567bhp supercharged V8. And if you try and use all of that power, the XJR becomes… interesting. It’s not just the roll, it’s the pitch: the front end dives quite dramatically under braking and the front rears up whenever you put your foot down. It doesn’t help that as a supercharged engine, the throttle response of the 5.0-litre V8 is a little sharper than the M5’s turbo engine. It reacts before the chassis knows what the hell is going on, and as such, you need to really think before you put your foot down. You tend to get understeer on the way into the corner, and then the rear end wants to break loose on the way out. Or if you have the less-than-sophisticated traction control turned on, the whole thing just bogs down while much of that 567bhp output vanishes. The silver lining is the steering. While it’s slower than the BMW’s setup, it does feel more natural. There’s even a little bit of feedback going on. 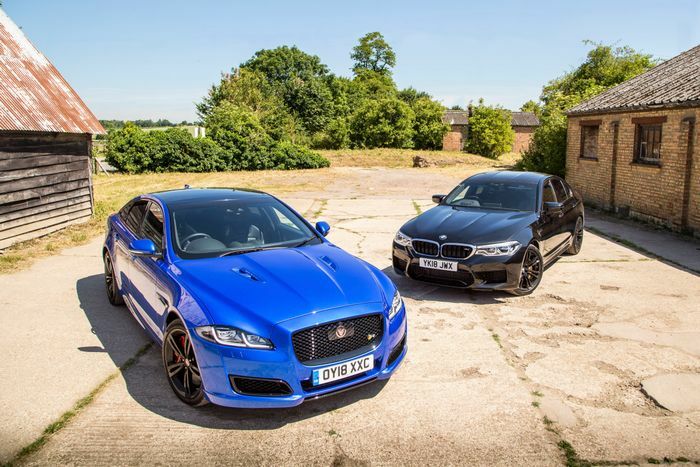 There is one thing that links the way the M5 and XJR drive: they’re both scary. It’s just that they’re terrifying in opposite ways. The Jaguar is scary because the chassis can’t keep up with the engine. But the BMW? That’s scary because it can: Wherever you are, whatever the conditions. We don’t want to be too down on the Jaguar, however. It feels prehistoric enough in isolation, so bringing it together with the M5 was always going to make it feel like more of a dinosaur, in terms of the chassis and the interior which - although stuffed with a decent amount of toys - really does feel behind the times. And that’s why we love it. Its remit is different. 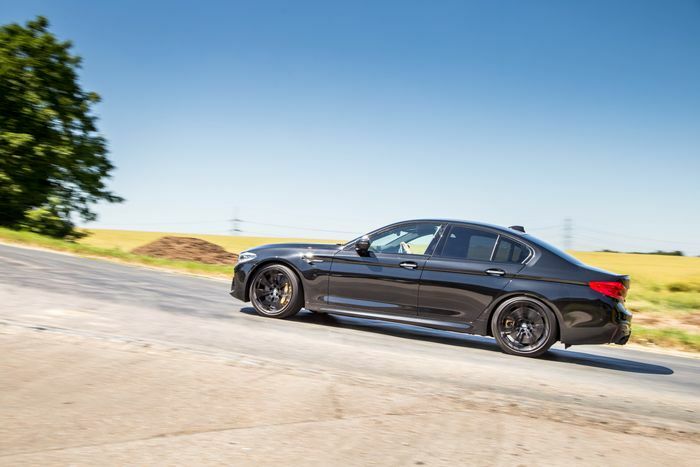 It’s not worried about going toe-to-toe with the M5, or even the super saloons in its own segment like the M760Li or the Mercedes-AMG S63. There’s something refreshing about that. You know what it is? It’s the closest thing Britain makes right now to a muscle car. From its filthy V8 exhaust note to its point-and-squirt attitude, it distills the ethos of its American cousins into a sumptuously leather-lined capsule of waftiness. The driver in me may want to go home in the BMW, but my heart will have always room for a V8 Jag.